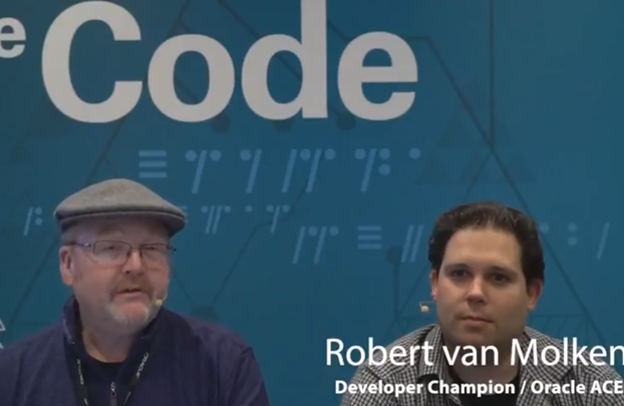 Robert Van Molken, author of "Blockchain Across Oracle" (2018, Packt) discusses the disruptive power of Blockchain, and offers background on Hyperledger Fabric and Composer. Watch the video here. Three new ways to drive your business forward. innovative products, automate tasks, and minimize costs. Read the complete article here. Target Partners: SaaS partners to innovate & System Integrators building innovative COTTS solutions. Demo Services: Soon at https://demo.oracle.com and request via the community wiki for more information please see here. 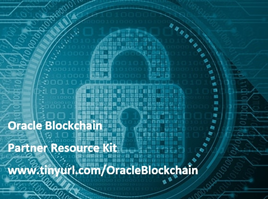 The Oracle Blockchain Platform SDK is now available on OTN for NON-PRODUCTION use. When you have installed the Studio Community Edition register your first tenant in our Azure UiPath Orchestrator version. Once you have undergone the core trainings and you have set up your Studio and Robot for the community Edition, registered your orchestration tenant in the Azure Orchestrator version. 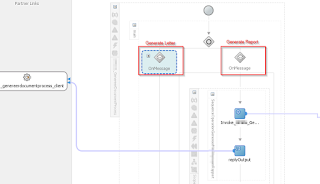 You can start testing the REST API to the orchestrator to activate the robots. Here is the detailed API documentation. Get the complete kit here. Previously in this blog series, we’ve explored some examples of how businesses and software vendors are using automated intelligence (AI) and application programming interfaces (APIs) to innovate with disparate data sources—combining them to deliver greater value for customers and workforces. 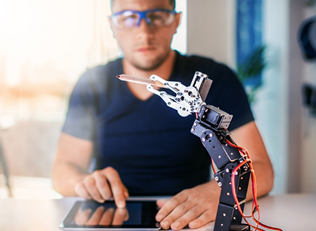 Another area of innovation that’s improving the way organisations go about their business and the way they serve their customers is robotic process automation (RPA). For many, when they think of RPA, they think of large, cumbersome mechanical processes augmented by robots and industrial machinery. But take a moment to consider how many repetitive, low-value, mechanical and time-consuming—yet essential—tasks are carried out by members of your workforce. For some time, one of the main barriers to automation has been the ability to replicate human operations for repetitive tasks. RPA bridges this gap with robots that are easy to train, don’t require changes to your underlying legacy systems, and—crucially—can execute flawlessly. Beyond the physical robotic applications that we’re perhaps more familiar with, software robots can also be trained to log into a system, enter information, port data between SaaS and on-premise applications, and commit transactions—just as human operators would do. So what about your business? How many of your daily business operations—the tasks and processes you perform routinely—could now be taken over or enhanced with RPA? And if your workforce was relieved of the burden of those tasks, how would you take advantage of the extra resource made available? Consider these two cases in point. US-based broadcast group, Sinclair, implemented its ‘One Sinclair Experience’ transformation after a period of major merger and acquisition activity. Their aim was to provide a simple, tablet-based interface for marketing consultants to sell their national solutions at a local level—comprised of offerings from across all the newly acquired companies. The resulting tablet-ready experience uses RPA as part of a solution that’s drawn together back office services from across all the companies, resulting in 12x faster process and 45% lower total costs. Read the complete article here. 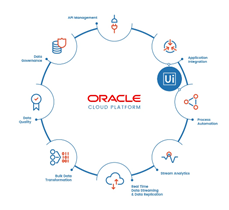 P lease join the Oracle Integration Cloud (OIC) product development team for the next in a series of partner webcasts to review our Brand New offering of Oracle Integration for Oracle SaaS, as an evolution of Oracle’s leading enterprise integration offering. Leaders from OIC Product Management will highlight the hottest integration topics including prebuilt recipes and proven patterns with Oracle SaaS, our new offering and pricing, and customer use cases. Yesterday I ran into this pretty weird problem. I have two BPEL services to generate documents using BIP. One I created earlier that is based on a generic XML used by BIP to generate multiple letters. Now I had to create another one that is a report, so uses another XML. I generated an XSD for both XML’s but since they haven’t got a namespace, but same element names, I can’t have them in the same composite. So, I duplicated the code. I created a WSDL with two operations, one for the letters and one for the report, so I wanted to call the report from the service that created the letters. The first service is called ‘GenerateDocument’, but with an operation ‘GenerateLetter’, but with an added operation ‘GenerateReport’. So I changed the BPEL and replaced the ‘Receive’ by a Pick: In the invoke it calls the ‘GenerateReport’ BPEL service, that does basically exact the same as in the scope under the ‘Generate Letter’ OnMessage. So, called seperately, the ‘Generate Report’ service functioned just fine. Also the ‘Generate Letter’ operation of the ‘Generate Document’ service, thus the ‘Generate Lettter’ OnMessage from the Pick above, function just fine. But, when I call the ‘Generate Document’ service using the ‘Generate Report’ operation, resulting in the other OnMessage I’ll get the following message on return from the Base64Encoding service: Read the complete article here. 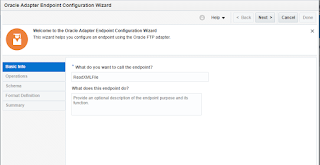 This article will show you another capability of Oracle ICS / OIC FTP adapter to Read XML files. After this article, you will be learned how to parse XML files which reside FTP location. In the previous article we have showcased how to create FTP adapter.In the example, an ICS scheduled will be developed which will read an XML file from SFTP location and logs the data in logs file. Enter the Endpoint name as per your choice and Click Next button. Read the complete article here. 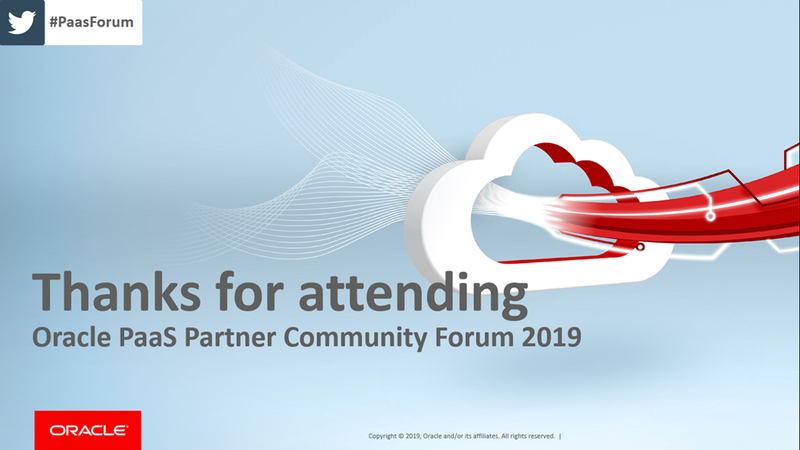 Thanks for your huge investment to spend a week attending the Emerging PaaS Partner Community Forum 2019 in Spain. Partners are key for Oracle’s PaaS & Fusion Middleware growth – Thanks for your Specialization & Contribution. Special thanks to all presenters and trainers your content rocks! 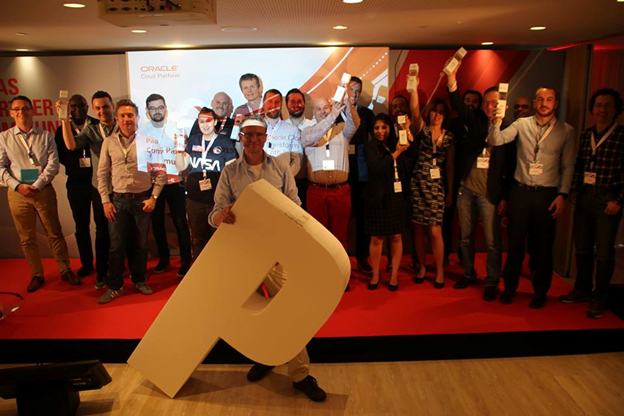 With 785 attendee days the conference is the largest PaaS partner event in EMEA. Thanks for attending the conference & labs and a good trip home.